Macklin Motors has revealed extensive plans to invest �million to construct a purpose built state-of-the-art Nissan dealership in Glasgow. 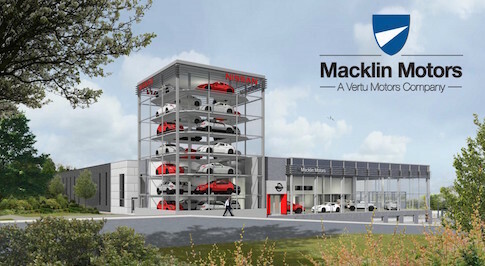 The new bespoke dealership complements Macklin Motors' existing Nissan sites in the city and will serve to strengthen the bond between Macklin Motors parent company, Vertu Motors plc, which has eleven Nissan sites throughout the UK, and the Japanese car manufacturer. Work is already underway at the former site of publisher DC Thompson's print works as the building is demolished to make room for the new flagship Nissan showroom. Once the demolition is complete, construction on the unique three-storey building with stunning eight-storey glass tower can begin in earnest. The layout will include a new car showroom at a raised level and used car sales at a lower level alongside a multistorey car park for vehicle storage. When the construction of the flagship site is complete in mid-2016, it will be a one-stop shop for all things Nissan, with Macklin Motors' different offerings divided across the floors, including a wide range of fleet and commercial vehicles and an official Nissan High Performance Centre, which will sell luxury vehicles such as the Nissan GT-R. The site will also include an MOT and service centre meaning everything a customer will ever need, from purchase through to service and MOT, will be available in one central location. The dealership, which will be known as Macklin Motors Nissan Glasgow Central, will create around 35 further jobs, including several apprenticeship opportunities in the service and sales departments. Robert Forrester, CEO of Vertu Motors plc, which owns Macklin Motors, said: "We will be investing around �million over the next 12 months in the construction of this flagship site in Glasgow. "Building a brand new dealership in the heart of the city, close to the M8 is a big investment, but it will all be worth it once the building is complete. The design is really unique, possibly the first of its type in Scotland. We will have vehicles throughout two floors of the building, which will be mostly made of glass, and the cars displayed inside the eight-storey tower will be visible for miles around. We hope that it will create a lot of jobs in the area and also provide an opportunity for young people to learn a trade as part of our apprenticeship programme." Robert Auld will take on the role of the General Manager of the dealership once it is completed, he said: "We're very excited to see the building complete. It's going to look fantastic, the glass panelling in particular is something really unique and I'm looking forward to seeing how it looks. "Macklin Motors are currently the only Nissan dealer in Glasgow and we're looking forward to cementing our place as the number one Nissan dealer in Scotland, delivering the very best customer experience for all our Nissan customers."